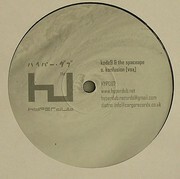 Kode9 & The Spaceape return with their first fresh collaboration since their scene-stealing ‘Memories Of The Future’ full length back in mid 2006, and a version excursion which also serves as a prelude to their new album due later in 2008. The instrumental to ‘Konfusion’, a breezy, almost horizontally reclined groove that drops like a ton of gold bricks wrapped in silk, was produced just after the ‘Memories…’ album was completed and has spent a year and half gestating on dubplate, featuring in edited form both on Kode9’s Sonar Mix CD of last summer of 2007 and his infamous November 2007 Rinse Fm back-to-back radio show with Flying Lotus. The instrumental was recently vocaled by a chorus of cloned Spaceapes via a glitching, interstellar walkie-talkie. A warm draft from a summer to come, and frothy man like cresta lemonade (ask yr dad).